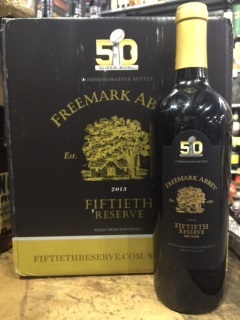 Freemark Abbey Fiftieth Reserve 2013 Spring Mtn. The only commemorative Super Bowl 50 wine. A stunning Meritage wine made from mostly Merlot, showing opaque depth of red ruby color. Rich, dark fruit aromas of cherry, bay leaf and dried herbs.